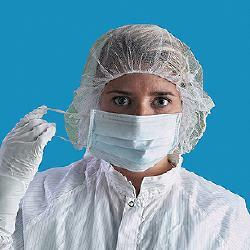 This 3 ply earloop mask is cool and made of latex-free, nonwoven, pleated, glass-free, non-linting materials. The nose piece is enclosed to ensure safety and floss covered earloops allow swift easy donning. This mask is 7" x 3.5". 100 masks per bag, 10 bags per case (1000 masks per case). Sold by the case.